Now wonder chambers may have aimed at revealing the power of the sciences and technologies to the collector – who was inevitably a wielder of political and/or economic power. But the function of museums was precisely the opposite: the power of collecting per se was to be offered to or concealed from a large number of visitors under the guise of enjoyment. The rededication that, as of 1800, turned royal parks, buildings, galleries, etc. into public institutions also made trophies into monuments and spoils into artworks. Hence, technological knowledge was no longer the goal or result of a collection; it now became its both necessary and covert condition. There was no museum that did not address, archive, and catalogue; and also no museum that kept its visitors from accessing these technologies. Among all the technologies that (to quote Heidegger freely) hide their essence, none seems to have had as momentous an impact as historiography. Since 1800 paintings have been hung on museum walls in chronological order, transforming time into a self-evident axis that not only orients all past art but also preordains the placement of all future acquisitions. […] So history as paintings came together with the chronologically arranged museum. The haven that, according to Valery, a museum offers for paintings and statues would be called “storage” in the cold terminology of computerese. For of the three functions of a Universal Discrete Machine (storage, transfer, and processing of input data) two functions, transfer and processing, are omitted in a museum. 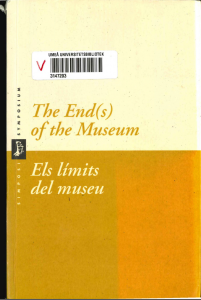 Nothing must be changed in things that are preserved – as usually stipulated by an actual government contract; and for the things that a museum keeps in its depot and selects for exhibition, the presentation itself already counts as a transfer. In other words, the museum is a hybrid medium that – historically or opportunistically, but in any case unsystematically – coupled its elementary storage functions to other media of processing and transferring. The rift between art and technology, as inflicted by the classical museum, remains untouched by modern forms of presentation. Now since 1900 at the latest everything has again been judged worthy of storage, but only according to the schema or schism of two cultures, each of which ignores the other. Technological museums do not ask how the media have supplanted the arts, and art museums do not ask what the arts owe the media or the media the arts. Their mutual indifference may have been possible and feasible so long as the transfer media dominated the other technological media, while the museum continued to specialize in storage. But in the context of an information system that tendentially abolishes the principle of transfer because it reduces all transfer to the processing and computing of data, mere storage per se appears somewhat dysfunctional. Items may be squirreled away for a planned eternity while their processing goes no further than ordering or cataloguing and their transferring no further than loans to other museums, but this does not make them information. We can therefore all the more readily understand the most recent hope of museums: to find a new refuge for this former haven of captured paintings and colonized ruins. As we know, everyone is now talking about the virtual, i.e., computerized museum, and that must be the reason why a media historian has been invited to Barcelona. Visitors too – they especially – should be given access not just to lovingly presorted information but to all available information. So in contrast to site-specific or redundant things, the systematic hookup implies that the museum, instead of privately crossing borders, builds up interfaces for the new reality of digital archives. For it is the structure of such archives, and not their presentation, that can smash through an elementary barrier of the museum. Unlike all other media (with the sole exception of Gutenberg’s book printing), digital storage is basically combinatory. It forms lists of lists, trees of trees, rings of rings. However, combinatorics is that unique realm where all mathematical simplifications such as the calculus are doomed to failure because amid increasing complexity the computing times grow in exponential or even hyperexponential functions. Hence their complexity surpasses any human dimension, and for that very reason it feeds an artistic metaphysics or madness that refuse to so much as look for combinatory contexts. So all that remains is the celebration of the isolated works or – a borderline case – of the torso. Just as chess conundrums and chess computers are among the few promises that artificial intelligence has managed to keep since Turing’s days, so too should digital archives give the museum combinatory power. For in the last analysis, all things shown by a museum are symbols in the true sense of the word: splintered shards of a tessera hospitalis that have yet to be pieced together or contextualized. In line with its imperial and colonial origins, the modern museum made sure that the found fragments were refragmented like mangled limbs in depots and exhibition spaces. But because listing all these items, not to mention assembling them, would take human beings an impossibly long time, only a computer could, as exemplified by Cluny, handle such a gigantic jigsaw puzzle. Thus, museology would have the task of developing appropriate search algorithms or restructuring them in terms of their “job descriptions” – that is, especially for the purpose of recognizing shapes. Only after this combinatory feat would the hoarded data also be information. For, to vary a Hegelian utterance, even archeological knowledge is only as deep as it dares to lose itself in its dissemination. However, the dissemination on which combinatory procedures operate implies the existence of a space – no matter how abstract – while time counts only as a computing expenditure. That is why digital archiving, beyond any gaining of information, also has methodological effects on the archive known as a “museum.” Digital archiving could break up the alliance that the museum has maintained with history or even historicism since 1800. The chronological sequence, as the emptiest of all kinds of order in which stored things are to be put, could be replaced by an order of co-presence once their combinatory connections were located. Friedrich Kittler: “Museums on the Digital Frontier”. 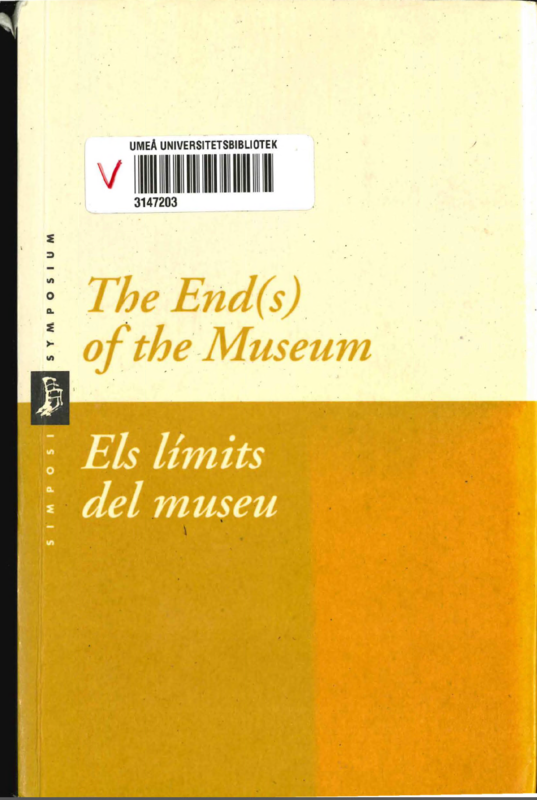 In The End(s) of the Museum / Els límits del museu (Barcelona, Fundació Antoni Tàpies, 1996), pp. 67-80. This article was posted in Snippets and tagged archive, digital, Museum. Bookmark the permalink. Follow comments with the RSS feed for this post.Post a Comment or leave a trackback: Trackback URL.